Doug Muller takes us behind his house to see a refrigerator set neatly in the earth. He and his partner, Ken Greene, co-founders of the Hudson Valley Seed Library, have numerous buildings on their land in Accord, but not one root cellar. Their farm, shared communally with others, is an old Ukranian camp where buildings weren’t designed for winter’s needs. So what are these committed self-sufficienados supposed to do with their potatoes, beets, and rutabagas? 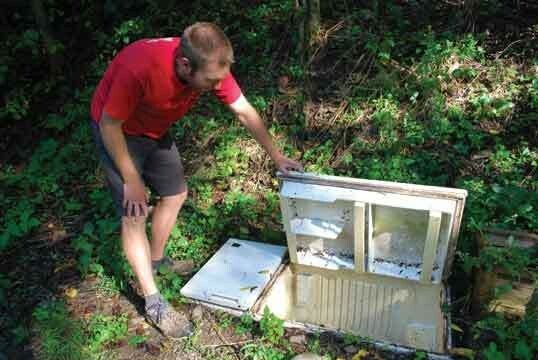 Fortunately, the previous landowners left behind a myriad of defunct refrigerators and freezers. The sunken fridge had some problems. The rutabagas and radishes did fine, but at a certain point in the winter, the potatoes froze and turned to mush. Muller says, “What would’ve made it work better is if we had used straw bales on top for additional insulation. Just the foam that’s in the door of the refrigerator didn’t cut it.” He says this winter, he’ll also add a piece of scrap metal sheeting that will allow moisture to drain away from the surface of the fridge. The second fridge, hoisted up to the old camp building closest to their house, was highly successful. As an aboveground storage unit, it would need a little help to keep the contents from freezing during the coldest parts of winter. Muller intended to run an electric cord out to the fridge to allow for a thermostatically controlled infrared light—like the kind used to warm reptiles— that would generate just enough heat to keep the contents at about 40 degrees. (Infrared produces no light, which is important, so things don’t sprout.) But as a busy homesteader, farmer, and seed librarian, Muller ran out of time. In a pinch, he improvised a system that got the aboveground freezer contents through the winter nicely. For those who dehydrate extensively like they do, Greene recommends the use of a pump-and-seal type of device that maintains a vacuum in the Ball jars of dehydrated veggies. Sunken fridges and winter storage pits are great for crops like potatoes, carrots, beets, and parsnips that require a relatively high degree of humidity to keep fresh. You can find plans for winter pits in classic food storage texts like Rodale’s Stocking Up or in Putting Food By (Hertzberg, Vaughan, and Greene) or Living the Good Life by Helen and Scott Nearing. In a more contemporary context, many follow the advice of master grower Eliot Coleman from books like The Winter Harvest Handbook. 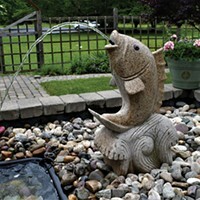 Among Coleman’s fans are Allyson Levy and Scott Serrano, owners of Hortus Conclusus LLC in Stone Ridge, who use their work in edible landscape design to fund the long-term development of a botanical garden on their property. Their house has no basement or cellar so they are working on plans for a greenhouse that will have modified storage bins to serve as root cellars within the structure. One major consideration in winter storage of vegetables is how much humidity each crop needs. So while carrots and potatoes need a relatively high level of ambient humidity, winter squashes, onion, and garlic need less humid conditions. That’s the mistake I made years ago when I lived in an apartment house with a root cellar. I put winter squashes down there, but it was too moist, and they rotted. I would have been better off putting them in my closet. Storing crops like winter squashes that like less humidity is easier than digging pits in the earth, but still requires some savvy. 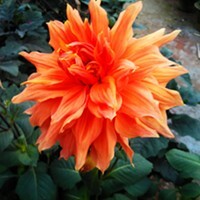 Respected local master gardener, volunteer, and vegetable gardening instructor, Mary Nisley, writes a terrific blog, Mary’s Veggie Garden. From mid-July, when Nisley starts harvesting carrots, until February, about 98 percent of her family’s vegetables come from the garden! By April, she is still supplying her family with 50 percent of their produce from storage. Nisley doesn’t have a root cellar, but rather an unheated basement, where she stores quantities of winter squash on shelves in single layers. In the Cornell Cooperative Extension newsletter Dutchess Dirt, Nisley says, “The best winter keepers are squashes that have thick skins and somewhat dry flesh. Butternut, hubbard, buttercup, tetsukabuto, and spaghetti squashes all store extremely well. Squashes store best at 50 to 55 degrees F and a humidity of 50 to 70 percent. Even though the basement is warmer now, its temperature will drop to the ideal by winter.” She stores sweet potatoes in the same manner (they like conditions dryer than regular potatoes, interestingly). I don’t have an unheated basement like Nisley, but I have a guest bedroom that we run cool in the winter. I’m eyeing that space, picturing an undulating array of winter squashes. As long as I cull out any that get funky, I don’t think my guests will mind. The Hudson Valley Seed Libraryâ€™s Doug Muller experiments with storing produce in a sunken refrigerator. 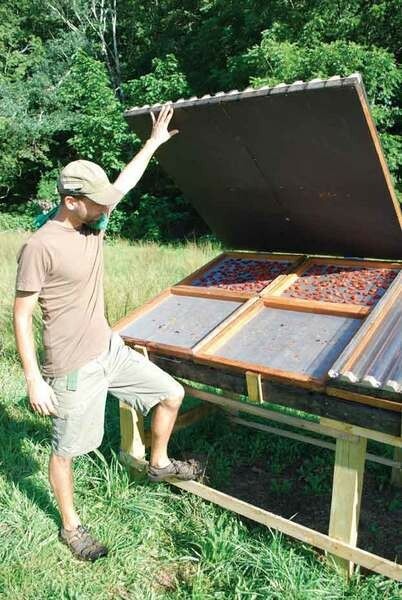 Ken Greene with the solar dehydrator built by partner Doug Muller. 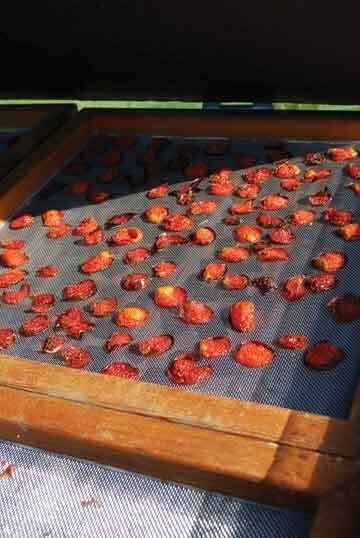 Tomatoes in the solar dryer at Hudson Valley Seed Library.